Need a Little More Space in Your Bedroom? 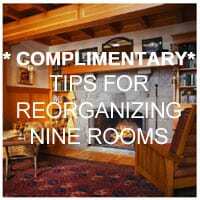 Start by determining any special uses of the bedroom (e.g., home office, baby’s crib and supplies, etc.) Only have items in the bedroom that serve the purpose of the room. Remove all other items. 1. Store your clothes in the closet. Double your hanging space by installing a lower hanging bar. Add an extra shelf up high in the closet to store off-season items. 2. Under-bed storage containers are very helpful for oversized items or off-season clothing. 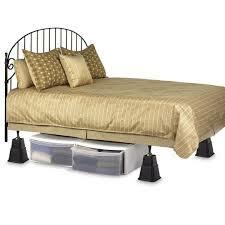 You can raise your bed to create more storage by using bed risers to lift the bed up. 3. A night side table with a drawer and shelf or cupboard will provide more storage than a table. 4. Use vertical space to add more storage. An armoire or high-boy may suit your room better than a long, low dresser. 5. Use the inside of the bedroom and closet doors to hang items. 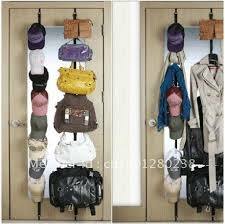 Over-the-door rack and hook products accommodate shoes, jewellery, scarves, ties, etc. 6. Reduce the amount of bedding to a minimum. Have 2 sets of sheets one on the bed and one extra set. Have a light weight blanket for warm weather and a heavy blanket for cooler seasons. Let me know which tip you liked best and add your own tip in the comment box. We each have a night table with two drawers – perfect for storing small items and keeping them out of sight! If any piece of furniture can be designed for form and function it usually end up being more useful. The added area of storage in furniture, a drawer, shelf,cupboard, pocket, hidden space etc will make the room easier to keep organized. My night table has 1 drawer and a cupboard. Great for storing small things and my stack of books all out of sight, the way that works best for me. I love the baseball cap storage on the back of the door. Bought 2 of those years ago and it has been a lifesaver for my husband’s many caps. When it gets full and he buys another, I tell him we’ve gotta let one go. Not easy, but I’m trying to keep the limit! Having a lot of baseball caps seems to be very common. My dad (93) still buys a baseball cap from almost every place he travels to. Thanks for sharing about the baseball cap storage for the back of a door. I use all of these ideas in my bedroom too! I especially like the 4 plastic containers that fit under my bed for storing off season clothes. I like being able to separate them by tops/pants/sleepwear/shoes. Thanks for sharing this on POBC! Under the bed storage for clothing can be very convenient depending on the layout of your home or apartment. thanks for sharing how you use them.